After years of planning, Walt Disney's very first theme park Disneyland opened its gates at 2:30PM on Sunday July 17, 1955 in Anaheim, California. 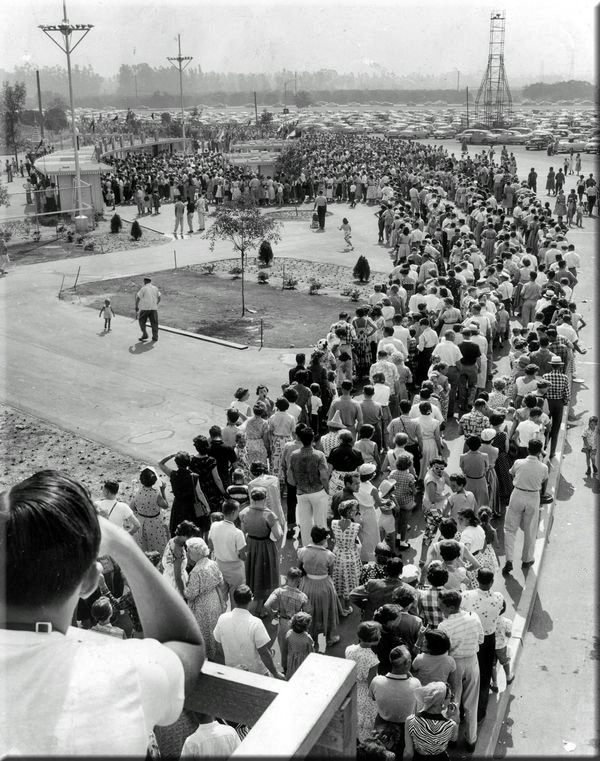 Television crews, Art Linkletter, Ronald Reagan, Bob Cummings, the Mouseketeers, Thurl Ravenscroft, California Governor Goodwin J. Knight and over 28,000 guests witnessed the opening of Walt's dream. Broadcast on ABC at 4:30PM, it was the biggest live telecast to date. Eighteen-year-old Bob Penfield operated the King Arthur Carousel that day - he was suppose to operate Peter Pan's Flight, but the attraction kept breaking down. 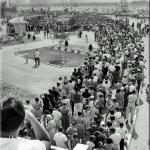 "On Opening Day I remember standing on the Carrousel when they lowered the drawbridge for the first time and all of the kids came running across." Penfield went on to become the longest working Cast Member in Disneyland history! grand opening were counterfeited, a surprising 28,000-plus attended. The day was marked by numerous disasters, including a traffic jam, a shortage of food, and a gas leak in Fantasyland. Even a chunk of window from the Mark Twain Steamboat crashed on the head of an invited state senator! Disneyland encouraged visitors to arrive before 4:15PM, as during the live ABC telecast the park's gates were closed from 4:20PM to 5:30PM. Cast Member Ron Dominguez was working as a ticket taker at Disneyland's main gate. "I was a Ticker Taker. Opening Day was a hectic day. The plan was to invite people at different hours so that we could spread out all of the arrivals. But it didn't work out that way. Everyone wanted to come out early to see the stars." Dominguez would spend his entire career at the park eventually becoming a top executive (between 1971-1994). Ironically he grew up on one of the Anaheim orange groves later purchased by Disney for the theme park. The Dominguez family house was located just about where the entrance to the Pirates of the Caribbean is! 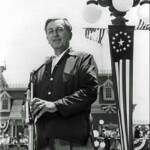 Celebrities visiting Disneyland that day included Frank Sinatra, Jerry Lewis, Sammy Davis Jr., Danny Thomas, Debbie Reynolds and Eddie Fisher. people walked down Disneyland's Main Street USA! Nine-year-old Bonnie Williams was an opening day guests because her church youth group was invited. 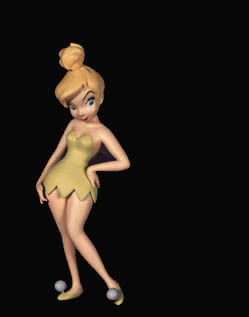 She was among the first children to cross the drawbridge into Fantasyland and ride Disneyland's rides! "I remember seeing Walt," she says. "He looked like a giant. I told him, 'I saw you on TV!' The whole day was magical. I felt like a real princess." "To all who come to this happy place: welcome. Disneyland is your land. Here age relives fond memories of the past...and here youth may savor the challenge and promise of the future. 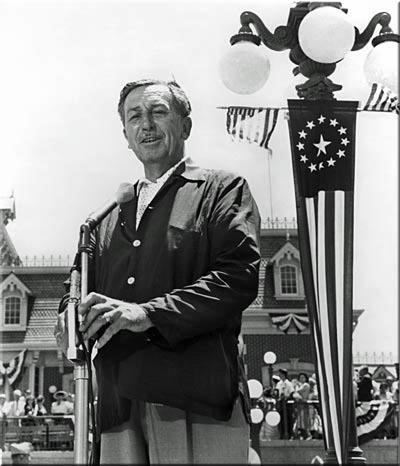 Disneyland is dedicated to the ideals, the dreams and the hard facts which have created America ... with the hope that it will be a source of joy and inspiration to all the world." Firehouse Five Plus Two, a Dixieland jazz band made up of Disney Studio employees and led by animator Ward Kimball, appeared at the firehouse on Main Street for the opening ceremonies. The group, made up of Harper Goff, Danny Alguire, Clarke Mallery, Monte Mountjoy, Ed Penner, and Frank Thomas, later played at the dedication of Frontierland. 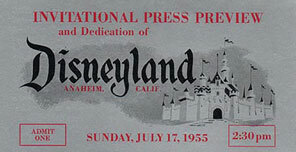 Disney consultant Harrison "Buzz" Price, who a few years earlier had chosen the then-sleepy agricultural town of Anaheim as the location for Disneyland, attended opening day. "I was on the bridge that led to Sleeping Beauty's Castle, and it was full of people. We couldn't move. and the asphalt was sticky. I looked down and saw Frank Sinatra, and he was cursing." Actor Fess Parker, famously known in 1955 as TV's Davy Crockett, led the opening-day parade dressed as the famous frontiersman and riding a horse! ''There were so many people I couldn't see the park!" he later explained. Future Disneyland President Jack Lindquist was there on opening day ... but as a guest. He was working for an ad agency and one of his clients, Kelvinator (an appliance company) invited him. "It was so overcrowded, and it was I think 105. I don’t know, but very very hot. But traffic wasn’t a problem, they had a great system of directing traffic. It came right into the parking lot, and then everything came to a halt. You had tickets that said enter at 1PM. Well, the people that had tickets that said 8am, 9am, 10am weren’t leaving. They were just adding more people going in, nobody was coming out." "It’s not apparent at a casual glance but this street is only a scale model. We had every brick and tile and gas lamp made 5/8ths true size. This cost more, but it made the street a toy, and the imagination can play more freely with a toy. Besides, people like to think that their world is somehow more grown-up than Papa’s was." 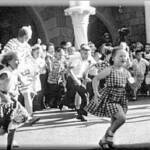 Also among the first children to run through Sleeping Beauty Castle was young Robb Fischle. He was also one of the first to experience Mr. Toad's Wild Ride. Starting in 1972 he worked at Disneyland and today is a park Security Officer! Imagineer Harriett Burns, the first woman ever hired by Walt Disney in a creative rather than an office capacity, was there on July 17 as well. "Oh, the crunch. Oh my gosh. We were all assigned different places... each person at the studio. They didn’t want everyone in the same area. They thought we’d be spaced out and sort of be “hosting” in different areas. But, it was just so crunched. They had counterfeit tickets and there was just this mob of people and it felt like 110 degrees. The asphalt was melting, every woman wore heels and my heels would sink into the asphalt. It was a miserable hot day." feel better because of it." swear I can pick me out of the group of kids on the bridge." builders, architects, urban planners for the next century."